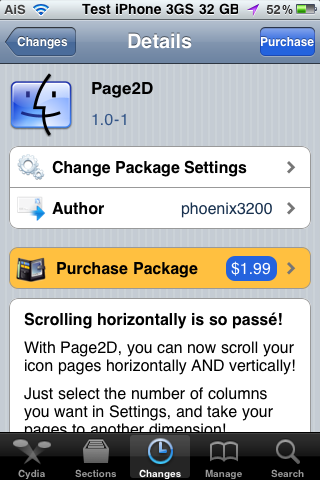 Page2D is a sweet hack that allows the SpringBoard to scroll both horizontally and vertically. This brings me back to the day (way before Apple came out with the scrolling SpringBoard) when we scrolled the SpringBoard vertically instead of horizontally. Anyway, this is a pretty cool hack that allows you to do both horizontally and vertically… allowing for A TON of page options. Check out the video demos below. Note the page dots on the bottom of the SpringBoard that help you keep track of what page you are on. I’m glad it adds the page dots because when I was watching the video, I was like, I’m sooo going to get lost in my pages! !